News: Presenting the New Maîtres du Temps Chapter Two Classique. Celebrating its 5th Anniversary. On the occasion of the 5th Anniversary of the launch of the Chapter Two Original, Maîtres du Temps - Atelier d’Horlogerie is proud to present the new Chapter Two Classique in red gold and white gold. This new model underlines even stronger the architectural aspect of the collection through its Art Deco inspired dial on which the bold indices majestically indicate the hours. The Chapter Two collection features an instantaneous triple calendar displayed in large format thanks to the innovative high precision cylinders that in fact makes it the most legible mechanical calendar wristwatch in the world. Its outstanding movement is imbedded in a shaped case that expresses the strength and character of this collection. Posted on September 9, 2014 by Editor & Publisher and filed under Maitre du Temps, News, Other Brands and tagged Maitres du Temps Chapter Two Classique Maitres du Temps Calibre SHC01 Daniel Roth Peter Speake-Marin Steven M. Holtzman. Maîtres du Temps is not so much a new watch company but an entirely new horological concept launched in 2008. Founded by Steven M. Holtzman, it brings groups of master watchmakers together to develop exclusive timepieces. Steven began his career in horology in 1982, when he joined the family owned business —Gruen Watch Company—one of the oldest American watch companies founded in 1894. In 1997, he created Helvetia Time Corporation —HTC— to distribute high-quality Swiss watch brands —including Roger Dubuis— throughout the Americas. With Maîtres du Temps, Holtzman acts as a catalyst for today's greatest master watchmakers to collaborate on the most innovative projects imaginable. This time in order to develop the Chapter Two, Steven brought together two masters of horology, Peter Speake-Marin and Daniel Roth. The Chapter Two ref. C2T.05.21.142 in 18K white gold is a fascinating timepiece featuring a triple calendar with a groundbreaking movement that includes two independent rollers to display the month and day of the week. This watch features a polished 'tonneau' shaped case measuring 58mm x 42mm x 16mm that is massive but very elegant at the same time. Every detail on the finish and design of this case exudes elegance and perfection. The chocolate color engine-turned sun-ray 'guilloché' dial with circular grain satin surfaces features printed roman numerals in white over a black background, running seconds at 6 and big date display at 12 o'clock. The month and day of the week are fully spelled on two black anodized aluminum rollers outside the dial at 12 and 6 o'clock respectively. 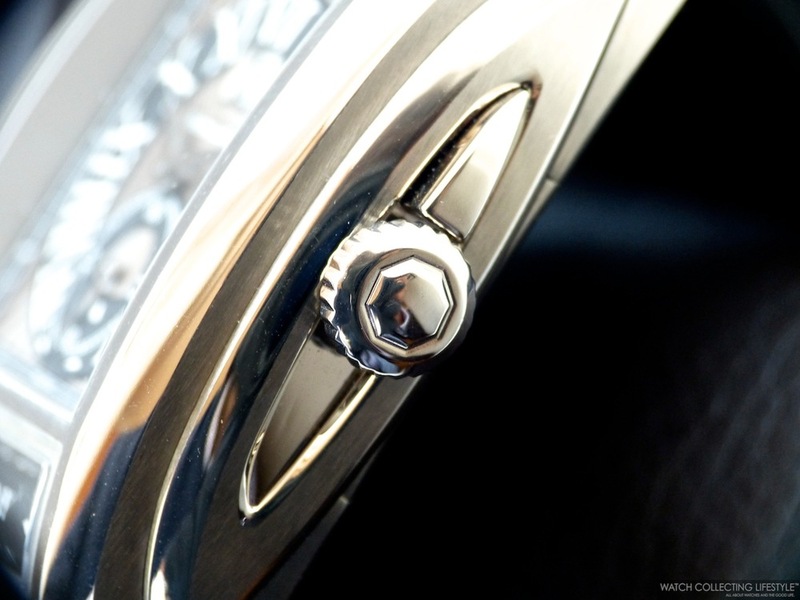 The hands on the dial are made of 18K white gold and sword-shaped with diamond-cut facets. This fascinating timepiece is powered by the automatic Maîtres du Temps calibre SHC01 with a symbolic goblet-shaped rotor in 22K gold, 'panier guilloché' and relief text that reads: "Masters and Their Craft A Life Long Pursuit of Excellence". The movement is comprised of 382 parts and 32 jewels and provides a power reserve of 50 hours when fully wound. The delicate finishing of the bridges features sun-ray 'Côtes de Genève', perlage, beveling, 'colimaçonnage' and polished screw heads. 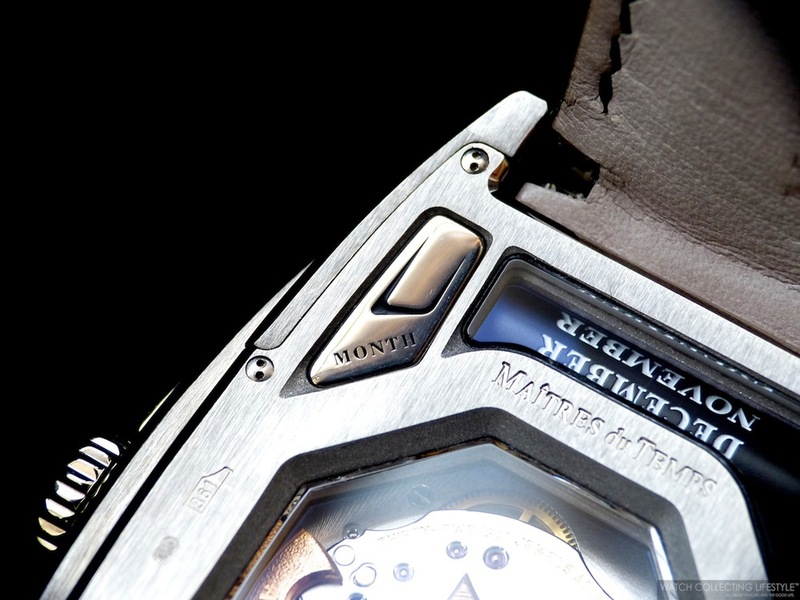 The movement and the rollers are fully visible through the octagonal display case back. Interestingly enough, this timepiece is fitted with a total of six sapphire crystals treated with anti-reflective coating and the day and month correctors are on the back of the case to ease the setting of these complications. The Chapter Two is fitted with a very elegant hand-sewn black alligator strap that is very comfortable and supple. The strap features a double-deployant buckle that is delicately finished and properly engraved. Even the finish of the strap lining is just perfection —notice the Maîtres du Temps stamping on it. This timepiece wears very comfortably on the wrist but sits quite high. Now, one thing that you will see when perusing or owning this timepiece, is that the craftsmanship behind it is just out of this world. This is 'haute horlogerie' in its purest form of expression. The watch is also available in 18K red gold and the dial colors available are chocolate brown, black, silver, rose or blue. Sticker Price $86,000 USD. For more info on Maîtres du Temps click here. Posted on October 23, 2013 by Editor & Publisher and filed under Other Brands, Maitre du Temps and tagged Maitres du Temps Chapter Two Maitres du Temps Calibre SHC01 Masters and Their Craft Steven M. Holtzman Gruen Watch Company Helvetia Time Corporation Peter Speake-Marin Daniel Roth Maitres du Temps Chapter Two ref. C2T.05.21.142 Posts 2013.